Join Inferno’s summer 2019 Doc:Team!!! Seeking young folx age 16-24 interested in journalism, media and documentary to be a part of our summer documentary team. Travel around Chicago, work outdoors, learn audio and video tech, build journalism and social media skills, and get paid! Created by Hameed Weaver and Tayvia Ridgeway, with help from CB. Special thanks to Jayve Montgomery, Ed Bornstein, Ben Lamar Gay, Johanna Brock, Rob Frye, Nicholas Cline, Tkumah Sadeek, Selah Say, and all of our collaborators in the Chicago Park District's day camps, special recreation groups, and TRACE program. You're beautiful -- keep shining! All music made in parks with park users, facilitated by Inferno artists. "What is resilience and how do you find yours?" Public art and garden project, "Bridge the Gap," designed by the Chicago Park District's Matthew Barrett, and collaboratively built by the Garfield Park Conservatory team, won the 2016 Gold Medal at the Bloom Garden Show in Dublin. Here are some of the conversations and stories Inferno captured about "Bridge the Gap" at it's reception in the Garfield Park Conservatory. Inferno had another chance to come and experience the Harvest Garden program at Gage Park! They taught us how to make a pumpkin vase just in time for Halloween. All video and music created collaboratively by the Gage Park Harvest Garden crew and facilitated by Inferno. Chicago, IL. The Harvest Garden Program at Union Park teamed up with Inferno to create a video explaining how to make pickled vegetables from their very own garden in Chicago, IL. As I anxiously walked up to a group of about twenty-five children, I did not know what to expect. Their eyes told a story of excitement and readiness. I put a smile on my face as I approached, but inside I was mortified. I looked over to my coworker, who assured me that everything was going to be okay. My first day of working with Inferno was one that I’ll never forget. The kids were so fascinated by all the equipment that they paid us no mind at first. It was not until they became overwhelmed with curiosity that they stated to ask us questions. I was especially nervous because I had no musical engineering background. I did not want to say the wrong thing or look stupid in front of the kids. After about five minutes of playing an icebreaker, I relaxed and felt more comfortable. The kids immediately started to tinker with the equipment when they were told to do so. I caught myself smiling extremely hard as I watched them make sounds from the piano and drum pad for the first time. We were both experiencing something so amazing. The joy they felt exuded through their laughter and body language. Their eagerness and excitement about the session was contagious. I was ready to see the magic they were about to create. What made that day so special and every day after was the feeling of happiness that everyone always left with. Inferno this summer is completely astonishing. Inferno allows kids and teens to creatively express themselves through music. In a society where children’s opinions and voices are usually dismissed, they are welcomed with Inferno. This program allows them to release whatever it is they want to say. You can see the empowerment they feel once the microphone is in their hands. It’s a relief for them. Sometimes it is a two-hour escape to a happy place for them. Inferno allows them to express whatever they are feeling as long as it’s in a positive way and beneficial to the group as a whole. These sessions teach them about the importance of being yourself, knowing that you are important, but mainly that others are important as well and that we should always listen to what they have to say. Even if some kids come to the session in a bad mood, they never leave that way. Inferno changes the way they feel about themselves and their environment for the better. This program is essential for the betterment of Chicago youth. A short documentary on the personalities and people of Piotrowski Park in Chicago, Illinois. Written, filmed, scored and produced by the young creatives in Chicago Park District's Arts XIII program during the summer of 2015. 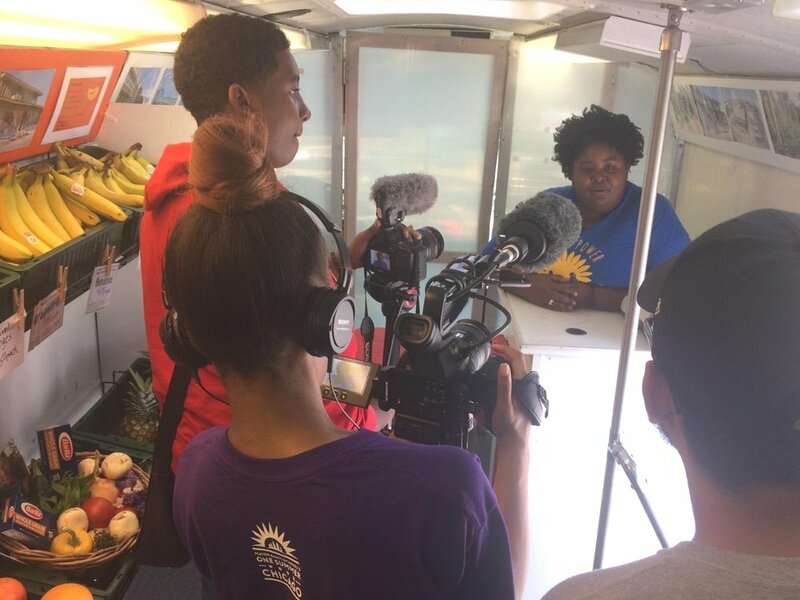 The Harvest Garden Program at Union Park teamed up with The Inferno Mobile Recording Studio to create a cooking show explaining how to make Sunflower Seed Butter out of seeds harvested from Millennium Park in downtown Chicago, IL. Participants took turns shooting and starring in the footage, and made all backing music. First Time-Lapse of the construction of the rustic mini-golf course being constructed by some elves at North Park Village. Watch in HD! Follow the instructions to the newest game in town...Created with youth at Austin Town Hall in Chicago, Illinois. Facilitated by Inferno.